The Marshall Plan, the historic U.S. aid initiative to speed western Europe’s recovery after World War II, is rightly legendary for its vision and accomplishments. The $13.2 billion the United States dedicated to the Plan from 1948 to 1952 would be worth a substantial $135 billion in today’s money. 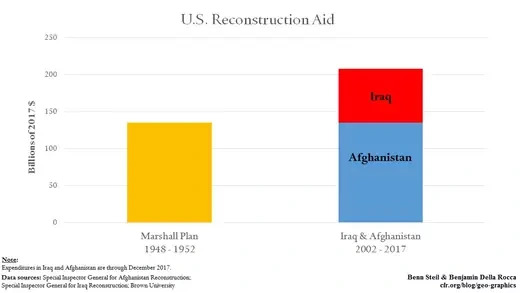 Although it is widely understood that the United States spent enormous sums fighting the recent wars in Afghanistan and Iraq, it is much less well known how much was spent on reconstruction. Through 2017, the total was $208 billion, in today’s dollars. This is over 50% more than the totality of Marshall aid, in today’s dollars. Yet the United States has tragically little to show for it.